Being a mom is undoubtedly one of the most rewarding experiences, but it certainly comes with its fair share of challenges. Subscription boxes for moms can help make life a little simpler and even help turn mom-mode off and promote much needed me-time. 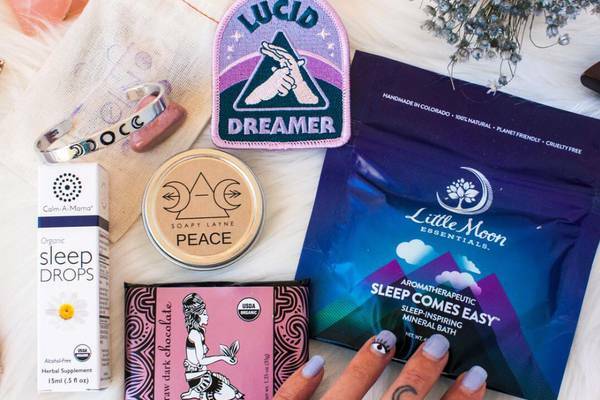 We’ve curated a list of some of the most popular subscription boxes for moms, from self-care and craft subscription boxes, to home decor and beauty boxes. We've even included monthly boxes that are great for expecting and new moms. Any one of these subscriptions would make a great gift, or a great treat-yourself gift if you're a mom looking for a little pick-me-up. Plus, Mother's Day is right around the corner and it's never too early to start looking for the perfect gift! What's Included: One of the best subscription boxes for moms is TheraBox, a monthly self care subscription box. 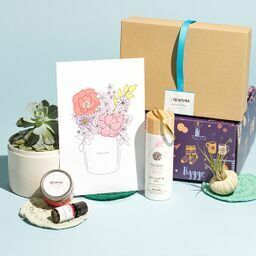 Each month's box is curated by therapists who aspire to bring more delight to day-to-day living, delivering 5-7 mindfully selected treats to help calm the mind and inspire joy, including organic skincare and beauty products, aromatherapy, artisanal treats and all-around good feelings. A perfect way for any busy mom to relax after a long day! 2. The Boxy Momma Co.
What's Included: The Boxy Momma Co. is a monthly subscription with a mission to support moms one box at a time! Each month’s box is curated around a new seasonal theme and includes full-sized products like jewelry, bath and home goods, beauty products, and stationery. Choose between two subscription options: The Mini Momma for 3-4 items, or The Momma Box for 5-7 items. Plus, $1 of every box sold is donated to Postpartum Support International. What's Included: Custom crafted to help outdoor lovers fine-tune their green thumb, My Garden Box delivers the gift of gardening each month. Featuring a living plant or seasonal bulb, enriched potting soil and a decorative planter, each month’s box can instantly liven up a window or add to a growing garden. Boxes also include step-by-step care and planting instructions. What's Included: Free Your Tea is a great way for your mom to discover new loose leaf teas that she'll love. The first box delivers sample-sizes for 6 tea varieties that she'll taste and rate based on her likings, then each subsequent box is tailored to her preferences. She'll receive a full-sized bag of loose leaf tea, enough for 30 cups, chosen just for her. A lovely personalized gift every month! What's Included: Coffee and a Classic is perfect for any mom who loves to curl up with a book. Each box includes a new classic book, something to sip on, 2 bookish items, and a bookmark. Choose the genre of your mom's preference (classic literature or classic non-fiction) and either coffee, tea, or hot chocolate for her to enjoy while reading her new book! What's Included: Mom Time Delivered is a monthly self-care subscription that delivers tired, busy moms a dose of relaxation. Each month’s box features 5-6 full-size products to help her get back some "me-time", including all-natural spa items, delicious treats and accessories. Each box is curated around a fun, seasonal theme and includes products that support small businesses and businesses owned by fellow moms! What's Included: For moms who love to express their creative side, The Adults & Crafts Crate is a unique gift idea. Arriving with everything needed to make a trendy, Pinterest-worthy craft or DIY project, unbox all the materials, accessories, tools and step-by-steps to dive in and get down to crafting a functional piece of art. 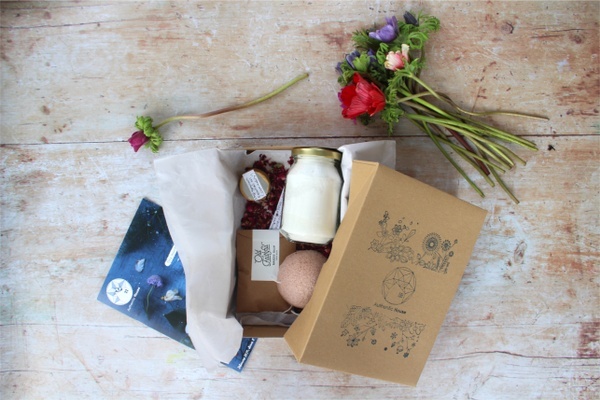 What's Included: Treat mom to an at-home spa experience with the Bath Blessing Box. Each month's box includes 5-8 luxury bath and body products, ranging from artisan bars of soap and body scrubs, to bath soaks and bath bombs. All items are curated around a new seasonal theme like "Recharge and Restart" for January and "Soft Supple Springtime" for April! What's Included: Charming Homestead is the perfect subscription service for any mom who loves home decor, but maybe doesn't have the time to shop for home accessories and decorations. Each monthly box includes 5 trendy home decor items like jarred candles, fun signs, kitchen accessories, and rustic soaps. If you're shopping for a mom who loves Joanna Gains and Magnolia Market, then she'll love this gift! What's Included: Having healthy snacks on hand is a must for any hard-working mom, whether it's to satisfy those in-between-meal hunger pains or to calm a fussy little one. Each month SnackSack delivers a variety of 12 junk-free snacks that are always organic and non-GMO. They also offer vegan and gluten-free subscription options for those with dietary restrictions, and include new snacks each month! What's Included: mintMONGOOSE is a monthly jewelry subscription that delivers high-quality, trendy pieces in each box. Choose between silver, gold, or rose gold jewelry, and whether you'd like the box to include earrings or watches, and each month's box will include 3 pieces of jewelry. All items are hand-picked to be versatile, perfect for everyday wear or to be dressed up for a special night! What's Included: Smartass and Sass is a monthly subscription box that promises to put a smile on any woman's face. Each themed box includes 5-7 delightfully snarky items like a fun t-shirt, notebooks, mugs, and tote bags. Products are hand-selected from artisans and small-businesses so the items won't be found anywhere else! What's Included: For the expecting or new mom, Oh Baby Boxes delivers everything she needs during her pregnancy or postpartum. Tailored to each mom's due date, monthly boxes include 6-8 full-size products like skincare, maternity fashion, and wellness products to pamper each momma! And once baby is born they start delivering postpartum products that ease each mom's transition. What's Included: SpiceBreeze is the perfect gift box for any mom who loves to cook! Each month's box includes pre-portioned, and freshly ground spice kits inspired by global cuisines plus recipes for each spice kit. Choose between two subscription options for either 2 spice kits or 4 spice kits with corresponding recipes each month. Plus, they offer free shipping and you get to pick the shipping schedule at checkout. What's Included: If you're shopping for a mom who loves to discover new products, then Color Curate is a great gift idea! 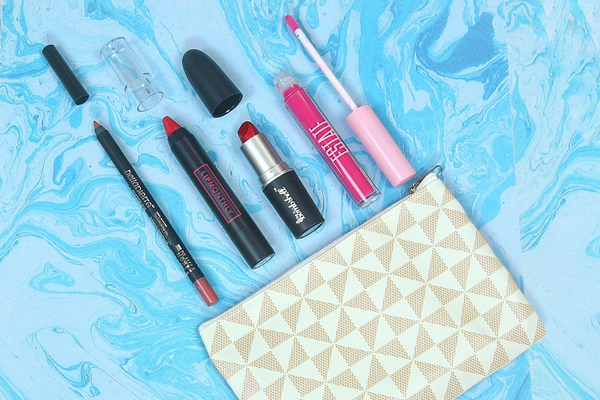 Each month's beauty items are packed in a fun makeup bag and includes 4 full-size products like color-intense eye shadow palettes, lipstick, and highlighters. What sets Color Curate apart from other beauty boxes, is that all products are always vegan, cruelty-free, and paraben-free. Didn’t find the best subscription box for mom? Check out our other gift ideas below!